The past week has been rough. After 18 months of 24/7 baby care, to wake up on my own, without having to get up when the baby wanted, is a strange feeling. I spent so long wanting and waiting to be a mom. I felt like it was my calling, my destiny, my dream job! Even with all the though days and the stresses, the sleepless nights and the tears, I knew it was what I was supposed to do. All I had to do was look into her eyes, and I knew that I was doing a good job. Now I just feel lost. I lost my job, my purpose, my motivation. I feel like I failed - not as a mom, but as an "employee." My job was to care for and protect her; give her all that she needed, and help her be a good person. But I couldn't keep up with the evil that was inside her. I feel like there were so many mistakes made since the end of her induction chemo. When we started informing ourselves of our other options, we were so overwhelmed. It was hard to focus in on the next thing to do. We thought we were ok, that we would be able to take a deep breath and have time to make an educated decision. If we had only known then what we know after doing so much research. I think this is the most upsetting. If we had started informing ourselves just a little earlier, started researching the options and the treatments available just one cycle before, we may have been able to make a decision that could have changed her course of treatment completely. I feel so responsible for not pushing harder and faster and staying up nights reading at the beginning. I know that there is no way of knowing if it would have made any difference, and that her disease was so aggressive that it may have changed nothing, but I can't get past that felling. We are told to trust doctors, that they know what they are doing. We are told that there is a standard treatment, and that's what you do. Everything is immediate, and nothing is optional. I have found that this is not true in the world of cancer. There are "standard treatments," but they are not the only option. I wish that we had been told that there were other places out there that did other things to treat this disease. Especially at the very beginning a little direction would have been so appreciated. If we had known to look farther than our own backyard then, we may have chosen different treatment, or we may not have; it may have changed everything, or nothing; but at least we would have felt like we had made a more informed decision. I am a true believer that everything happens for a reason. I know that someday, we will look back and say "that's why she went through what she did, to get us here." Nothing happens by chance; decisions that are made have a course. And, although I feel that I have a lot of luck in my life, I know that, in time, everything leads up to something bigger. But right now I'm feeling purposeless. I don't have a baby to feed or diapers to change; no doctors appointments or treatments to schedule. I don't have to plan around nap and bed times; I don't have to pack up a diaper bag and food to leave the house. I can pick up a purse and keys and go out at 9pm, leaving only the dog at home. Its a strange feeling. It feels as if I've gone back in time to before Saoirse came into the world, before I was pregnant, but I have the knowledge of the past 18 months haunting me. I had my dream, my baby girl; so strong, so independent, so happy, and it was all taken away too soon. Now its waiting. Waiting for answers, waiting for the next project, waiting for that aha moment when everything lines up again. I hate waiting. I feel myself longing to see friends with babies so I can play with them. Watching the kids at the mall is joy and torture all at the same time. I saw some women arguing in the parking lot over how one of them parked their car (it was crazy, I'm surprised there weren't punches being thrown) and all I wanted to do was walk over and tell them to appreciate that they still had their children and grandchildren with them this Christmas. There is such a hole in my heart. And so many other moms are having their next kid. Granted popping out another one is not the answer to our problems, but it would have been nice to have the option. Because of the treatments that I've been through, I have to wait at least two years from diagnosis to think about getting pregnant. It's more of a precaution than anything else. If I were to relapse while pregnant, it would be enormously tough to decide what to do. There is always the risk, especially since I had pregnancy onset Hodgkin's, but after the two year mark, my oncologist says it will be less of a risk. Back to waiting. Time to reboot. To give ourselves a break from the "real" world, and focus on us for a change. Then we will take on the world. Show everyone that Saoirse meant something, and that she will change the way the world sees childhood cancer. Maybe I'll become a parent advocate and help other parents sort through the wash of information at the time of diagnosis. Hmmmm.....that might be a good place to start. I just want you to know that I think of you and your amazing daughter every day. I came across your blog right about the time my son was diagnosed with NB and you have been a source of strength for me. It is incredible how many people have been touched by your story. 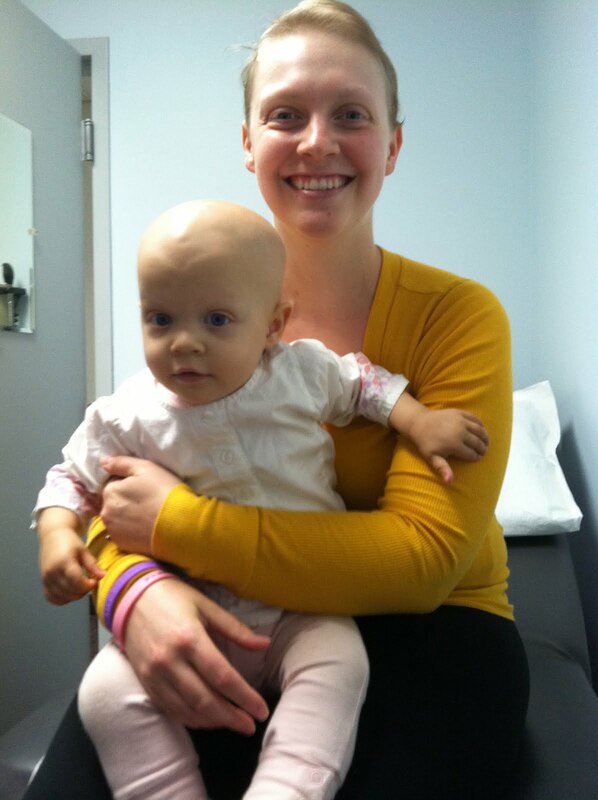 I'm confident that you and Saoirse will change the way the world looks at childhood cancer - that will be her legacy. I can also testify to the amazing power your baby girl has had on my life. Her life was so fleeting and her minutes were so full of life. She's such a blessing! Which is why it does sadden me so much that she is no longer with us or you, especially you. Someone so deserving of all the love in the world. I am so sorry. You carry her always in your heart, just not in your hands. But she was loved, and treasured and cherished. I do believe you will get that life you dreamed about, it is out there. And you will see those glimpse of Saoirse again. Love you. Hugs! I can feel the frustration. But good that you want to take it out in good way..Make sure you guyz hang on to each other and fight it out.. You guyz are tough..ALWAYS REMEMBER THAT !! You are awesome. I remember going through all the info for treatment for Nicholas and it was very overwhelming(and my ed is in brain science)! We all make the best chooses for our children. PLEASE try not to feel like your are less than a great mom. You did the very best you could. I love the idea of you being a parent advocate! I've followed your journey and hoped every day that something miraculous would happen. I have a 20 month old girl and even with the little things, I think we question whether our decisions were right. When there is no time to process what is happening, it is impossible to do anything other than trust those around you. My heart breaks for you that she is gone, I am always shocked by how aggressive some cancers are. I am sorry her's was one. She has a beautiful smile and her legacy will live on. Take care of yourself, know that many of us are holding you close to our hearts right now, and I am sure your life dream will come true. Your heart was obviously made to care for others. You will know what to do and when to do it. As you said, everything happens for a reason. Follow what's in your heart. Trust your instincts.....good things will happen. There is a pupose! I had something very sad happen in my life recently. I beat myself up with 'what if's' and 'should have's'...'what if I would have done this?'... 'I should have done that'. My mom explained to me that I can not live my life on 'what ifs' and 'should have's'. She is right. It will eat you on the inside. You are an amazing mom. You fought your hardest, as did your beautiful daughter. She will be remembered, your fight will be remembered. Fly free Saoirse, fly free. I think its natural to question everything after a loss such as yours. Losing someone you love is so confusing! I am so convinced that my lost ones are still here. I don't know how they are still here, but they are close. Very confusing. I think that you did everything right for Saoirse. I wish THIS was one area you didn't find youself questioning. For you to keep sharing your daughter and what she taught you is a wonderful idea. What an amazing way to honor Saoirse. Please be gentle with yourself. Saoirse wouldn't want it any other way. I know it's difficult to see & feel what I'm going to say right now. You and Mike are FANTASTIC parents. You both did the very best you could & what you did is WORLDS above what other parents do. With the determination you both have; your ability to reach the world; your story that has captivated no less than tens of thousands of people; Saoirse will continue to be well-known and change lives. Normally I don't post comments on blogs. I have posted to your facebook a few times. But I have to comment on this. I had cancer removed almost a year ago. Months later I saw your story on channel 5 Boston news. When I've gone back for follow ups I have thought of you and your daughter. Perhaps, she never got the chance to live a long life but I do believe she is helping the rest of us live ours. I have never met her nor have I met you, but those moments where I have thought of her could have been wasted on thoughts of depress, thoughts of anger, fear, etc. All thoughts that would bring me down. Instead it was your daughter taking up those moments. Bringing hope and making me feel better. Perhaps, her greatest purpose was to help save you. This cancer was lurking inside of you. What if something else would have triggered the onset? What if you never had her? You may have stressed so much about your health it might have had a negative toll on you not allowing you to get better. Without her you would have had that one less joy in your life [a great joy] Perhaps, it was what she brought to your life that helped you heal. Happiness and joy is contagious and is a healer. I am not going to sit here and act like I know what you're going through or even begin to understand. But as someone who never met her who has been positively effected by her I do feel I can say that she has served a purpose greater then one could imagine. You are going to be thinking about her and missing her the rest of your life, but at moments you will be unaware that others like myself are also thinking of her with love in our hearts and that positive effect will continue on. She was so young but has such great purpose in this world. 20 years from now she will cross our minds. We never met her. 20 years from now your next child who will have never met her will be thinking of her and talking about her to a friend. That friend will mention her to someone else and so on. There are so many reasons I can think of, that she went through what she did. I truly feel when such little ones suffer, it is for the rest of us. To remind us of what we have and to live our lives better, stronger, etc. Most of us can say we have had an effect on some people. Your daughter has had an effect on many many people and it will continue on. I think it would be so helpful to not only parents but people of any age who find themselves struggling to find the best road of treatment. It would be so amazing, if you did go out and advocate. If this cancer comes back in me, I am lost. I pray it never comes back. But I know if it did, I would need a place to go to easily sift through what is best for me. A website of information, lectures, books, from people who have been through it first hand. And what a wonderful tribute to such a beautiful, sweet little girl. She already started to help save lives, I truly believe when you are ready you will take it that much further and continue on her road of purpose. I hope and pray that this Christmas takes it easy on you and yours. Please know that so many are thinking of you and will continue to follow your story and support you. There are no words for a stranger say to one who has been so generously open with your life and struggles. I do seriously believe that people like you and some of my other friends, who are willing to share the unthinkable (a child's illness, an adult's diagnosis of 'no longer treatable') teach the rest of us to LIVE in spite of a terrible diagnosis, to let go when the time comes. It was clear that Saorsie was a wonderful spirit, and that she has a wonderful mother. My heart breaks for you but you are still showing the way. Keep up the blog if the spirit moves you because I think we all are rooting for you and your family. i am deeply touched with your story,my little girl of 15months was dionost with neuroblastoma aswell 3days ago, and today is her frist day of kemo treatment,they have found it in 3parts in her body,around her liver,neck and also around her beautiful eyes.with your terrible lost and experence in this evil diseas,i would love to hear your toughts in situation that me and my family is going trew. my name is luis merino and my email is xlbfamx@aol.com,i would love you hear from you,god bless you and your family. I came across your story on CNN. You and yours are in my thoughts and heart. My own baby is a neuroblastoma baby. People say to me "I don't know how you do it." Well, to that I say, "I don't know what I'm doing." I wake up. I try to eat well. I try not to dwell. I surround myself with people who love me. But I don't tell them that I am inspired by a mother like you who fought and whose baby fought neuroblastoma to the very end. I don't want them to know my baby could die too. I think I don't want to know that either. But even without NB a healthy baby can die. The love we have that overflows and changes the very mettle of our being is irrevisible. You will miss her always because she changed your very chemistry. Rationalizing a reason or thinking I did something wrong or off, I find, drives me nuts. Except when I remember the highest form of living is to just "be" and your baby girl did her best to be and you will try your best to be. In being and trying hard to not dwell I heal. Just keep feeling everything you feel. No excuses, reservations, rationalizations because you deserve to feel the way you feel because it's your road to peace. Watching you and other cancer patients is what helps me "do it." I find I don't know any other way. God bless you both. God bless you baby and mine. Keiza - it looks like Luis is your first client! Go help them save their daughter with your knowledge! You have Saorise's strength to walk you through this! This is a new page for you.... Much love from Alabama! I want to echo Shauna's comments. She was vey eloquent and very right. You and your daughter also touched my life in a profound way and I think the last paragraph in your blog shows that you are already being shown one way to give Saoirse's life meaning. Believe me, you and she will never be forgotten by me or anyone else who has been touched by you. God is with you. I take my phone from next to my bed here in Switzerland every morning and check to see if you or your hubby have posted. It's the first thing I do. I just wanted to know your baby girl was getting better. I am so sad for you. You have made us all fall in love with your beautiful baby girl. She will always be remembered from all over the world. I think the idea of you becoming a advocate is an incredible thing. You would be amazing as you are strong and compassionate. I wish that every day you feel a little less pain and loss. I will still get up every day and check for updates from you and your hubby as I am still out here wanting to listen to you both. I admire you for your strength and courage. May God Bless you and I encourage you to really think about being an advocate for parents whose children have cancer. Thank you. I have no great words to share... as a mom of a toddler not much older than Saoirse, I'm frequently brought to tears thinking of what you've been through and will still endure. All I can say is that her story has touched my heart and has made me remember and focus on what's important - a great gift, indeed. If I may, I just wanted to add one small thing... You mention you're waiting... waiting for the next baby, next job, next purpose, next life experience... but I think you're healing. Waiting is passive. Healing is active - even when the progress we make seems imperceptible. I so admire your strength. That you're getting out of bed, doing, moving, living - you are active. You are strong. And we are still here for you. Kezia, que deus fortaleca voce, que seu coracao se conforte. Sei que e dificil voce forma uma nova rotina, mais confie em deus. Nele tudo fica mais suave, e a Saroise no ceu nao quer ver voce triste, forca coragem e paz no coracao. My heart breaks for your family. Because of your beautiful daughter, I want to be a better parent- hug my children harder, appreciate them more, yell at them less. I can't imagine what you are going through, but she is at peace now- in the most incredible, loving, beautiful place. She will never feel pain, only love. I will pray for you and your husband. Kezia,I know it's not the same to lose a child versus a parent but I just lost my mom to brain cancer. We trusted the doctors and we lost her. My family and I have gone over it over and over in our heads of the "what ifs". I know it's so painful. After she died we were all lost. No doctor appointments. No schedules. No one to take care of anymore. You will never get over the loss but someday it will get better. Just know that the world is with you to love and support you and your husband. I pray for your strength and comfort every day. Your daughter was a little miracle who will live in our hearts forever. Kezia--Don't worry about what if's---you did all the right things and more. You bring up a great point though. A friend of mine had melonoma Stage 4 and one of his biggest issues was that he could not get straight answers from anybody. He went to numerous hospitals all over here in NY (including Sloan) and basically each one wanted to do diff. treatments and nobody would just tell him what to do. Then, becuase of his stage is was hard for him to get accepted into trials. It was like--you are so sick that you need the trials as nothing else is working, but you are too sick so you don't qualify for the trials. It made no sense. The only thing I did to help was research all I could and look for trials and send him anything I could find. I would lie to get access to medical sites and information that only patients or doctors could get to and that helped me to at least get the most up to date info. He had said if only he had an advocate or someone that could be by his side 24X7 and help with that stuff all the time it would have been a huge help. He passed 2 years this Nov. but I know he was at peace as was his family due to the pain he was in. Anyway, my point is that because of your situation you guys would be perfect advocates --it would be very hard for you but I think in time it is something you may want to investigate. I would think it would help with your healing as well. There are so many people out there just like you. I lost a very dear friend to lung cancer 2 months ago because she trusted everything that she was told regarding treatment options. I begged her to explore cancer hospitals, alternative treatments, even out of the country treatments... but you get in a comfort zone where you trust and believe. It is not your fault. But, to share your experience with other parents going through this IS THE PERFECT plance for you to start. If you can find your nitch helping them understand their options and being a counselor to them - I think that would make your daughter very happy. I think that she would want you to help other children to feel better and other mommys and daddys to understand better. If I could have just one wish - it would be to go back in time - just long enough for me to try to help my friend and for you to have the time you wish for as well. Stay strong. You are an incredible person. It just breaks my heart to read your blog. No parent should have to bury their child. And for both of you to be battleing this ugly disease is just gut wrenching. Like many others have said, you can't do the "what ifs". You did what you could with what you had to work with at the time. I know it is human nature to do so but...Praying for your family as you grieve for the loss of your beautiful daughter. And praying for you that you stay well. Keep your daughters spirit alive. Kezia, you and Mike have been amazing parents and you did everything that you could have done. There are too many whys and what ifs, but you will figure it out. Give yourself time. You are a very strong and positive person, I can tell by just reading your blog. You will be a great advocate for other parents and kids going through this. We all have a purpose in life, you found yours. You did everything you could, and you did it perfectly. Saoirse had a bad hand dealt to her, but she was so, so lucky to have you and Mike as parents. Kezia, you and Mike were the perfect parents because you loved your daughter more than your next breath. You did everything right with her and she knew that she was loved and taken care of. You have a kind heart and are a wonderful person and I feel you would make a great parent advocate, I'd trust you to help me in a heart beat. I'm so glad to see that you posted again, I checked your blog everyday for some sign of how you are doing, and you sound as though even through your broken heart and your emptiness you have found a foundation with which you can move forward and a wonderful way to keep saoirse in your life each and everyday through helping others. You and Mike are kind, good, strong, and I'm sure I speak for all of us following your story and reading your blog, that day or night you are thought of, people find you an inspiration, and you without a doubt always have someone out there who is waiting to hear about your triumph's and your set backs becuase you and your beautiful family have touched the world. I hope that I am half the mom you are, becuase if I have half your strength, wisdom, hope, and ability to love, then I know that I'll have touched someone's life the way you and your precious saoirse have touched mine. Reading this, I felt like I could have written much of this myself! After my Alexander died from his neuroblastoma - I didn't know who I was anymore - there were no clinic appointments to go to, not meds to get ready, no TPN to worry about. I didn't know what to do! Please don't question yourself for ONE MINUTE that you didn't do everything right for your daughter. You did everything you could and everything you knew about. This cancer is evil - and sometimes, no matter what you do, it just takes over. I was so happy for you when I read they got pretty much everything out during her resection (they did not for my son) I had such wonderful hopes for all of you! But sadly, the evil cancer was just stronger than anything that could fight it. I do not believe that "things happen for a reason" - there is NO Reason our babies got cancer and died! But, I do believe that we can make something GOOD come out of something so horrible. I too have thought about being a parent advocate - maybe we could start something together! Parents need help to navigate this crazy cancer world - insurance, medications, doctors! Maybe we can help change the world together in memory of our beautiful children! You are amazing parents. Everything you did had a reason, whether you realize that now or five years from now. All I can tell you is "one day at a time". Just think about today and all the wonderful memories of your precious, beautiful daughter. I admired you from the day one when i found you. I wish I can help you to pursue what you meant to be.. I know it is becoming a mom but I truly believe that you are meant to be a advocate for those who is hopeless and clueless about childhood cancer. Life is short and we go through a lot. People like you will shine the world.. and Saoirse, she will be right next to you while you are serving to shine someone else's life with bright light! I am praying for you and Mike. You will get there. and have MANY more children! I am praying for you! My heart breaks for your loss. As I read your heartfelt post, I felt it break all over again. I haven’t a clue how you and your husband are to wrap your mind and heart around all that has happened over this last year. Cancer is what gets in your face to say "You are not in control!" Your daughter and your whole family have touched countless lives. My heart just breaks for you. You are an amazingly strong woman & your daughter was absolutely beautiful. I can feel your pain simply by reading your words. I'm so very sorry for your loss. I am so, so sorry for your loss. There are no words to say. I pray that your memories of your time with Saoirse will bring you comfort. Please know that you did all that you could for her... the best that you could for her. She knows that. Since you mentioned being an advocate, maybe this webpage will provide you with what you need! Once again, I am sorry for your loss and I will continue to pray for you and your family. Saoirse will live forever in our hearts. You are an amazing woman and a mother, and you will be a mother again. please look to the future. I think of your family every day, and pray for you and all kids with cancer. We're sorry; tough battle to lose. Sounds like it is just time to concentrate on being person; head up, eyes ahead, knowing you did all you could do. You and precious Saoirse are in my heart every day. You are loved by so many. You did everything you could, and her life will not have been in vain. I believe you'll know the right next steps when it is time, and she will always be there - in you and around you and smiling down on you. Saorise is in the arms of the angels. The good Lord would not take her home one second before he planned on it. Her time had already been set before she was even concieved. He gives us our children as a blessing, and you did EVERYTHING any good mom would. Just know, that the Lord loved your daughter more than anyone ever could and she is safe now in his arms where someday you will get to be reunited in glory. God bless you and your husband through this tough time. May he give you the strength you so desperately need. Because, although it seems impossible now, he NEVER gives us more than we can handle. You did the absolute best you could with the information you had. You gave everything you had for your child. Please don't live in the what if's. (I know it is much easier to say that than live it). I followed a year or two ago another family who battled childhood cancer. I remember that mom crying out after their child lost their battle about not having information. What a wonderful way to carry Saorise name forward. You and your husband becoming the starting point of families struggling with a disease where so much is thrown at you and decisions have to be made....right now. Not a day goes by without thinking of you guys. I cry everytime I read your blog and Mike's blog. I wanted to comment on Mike's blog, but there is no way to do that without having any account like Google, etc. I just want to let you know that you and Mike are wonderful parents. I wish you strength and peace. Saoirse is no longer in pain. She is and always will be loved by so many us. Take care. I am so very sorry for the loss of your daughter. Just know that you are an amazing mommy and she was so lucky to have such a great mommy like you. I wish I had the right words to say to you..I am just so very sorry..Rest in peace beautiful angel! I think of your family often. Praying. Hoping God will help you both through this tremendous loss. Although I realize it's far from the same, my cousin passed away days before Thanksgiving at 39 years young. She had fought quite the battle most of her life. Hodgkins lymphoma at 15 years old. And more recently her body fought her. Damage and scarring from the radiation and chemo she received way back when. Back when they didn't know how to pin point radiation. It took it's toll on her organs and she could no longer fight just to breathe. The day I heard Saiorse became an angel, I pictured her, sitting on Andrea's lap in Heaven. Andrea never was able to have her own children, but she adored them. She even worked as an RN in L&D and was there the day my daughter was born. While I know Saiorse and Andrea finally know what it's like to be free from pain and struggle...it doesn't help the broken hearts left here. I pray for you and Mike daily. I pray that God will heal your hearts as best as He can. I pray someday you will find out why. I pray you will be blessed with another child to give your endless love to. No child will ever replace your beautiful girl, but I have no doubt that any child would be blessed to have you both as parents. Love and prayers. Thank you for posting again. I first heard of your story through CNN.com and was devestated when I say the headline announcing your beautiful daughter's passing. I am so sorry for your loss and can't imagine the pain you are feeling right now. I will pray for strength and courage for your family. Thank you so much for creating this blog. I sometimes feel as though cancer is rarely thought about until you are affected either directly or indirectly by it. Your daughter's story will no doubt touch millions of hearts and make us all think about the children out in the world battling a horrible disease. I read today about the tragic loss of your little Angel and I was so devastated to hear that she passed. I know that no words anyone says or anything anyone does can bring her back.. when that is all you want. My prayer for you and for your husband is that GOD will see you thru this, knowing that your sweet baby is no longer in pain and is in heaven surrounded by peace. I wish I could take this all away from you and I do not understand why we lose innocent, precious babies. May you be surrounded by strength in the days and years to come. I admire you, your fight, you love for your family and please know there are many, many people around this world that you will never meet that are thinking of you constantly. May GOD be with you always. I have read your posts for some time now, and have been so moved by you all. I am so very saddened by the loss of your precious angel, and cannot even fathom how you cope with such pain! Your family has amazing strenght, and I am in awe at all you do! I know her struggle and passing make no sense to any of us as to why any baby should have to go through that...but I wanted to tell you that you all have already helped so many others around the world by sharing your story! Your love for each other is a testiment on what "family" really means!!! May God grant you some comfort, and I will continue praying for you all! Love and thoughts from Canada for all three of you in this time of loss and sadness.